Kamakura Beer My Funny Valentine is a belated Valentines brew from Kamakura Beer that is a 5.5% dunkel style beer. We were out wandering around Yokohama when we came across it, and World Gourmet had just received a large batch as of writing. Kamakura Beer My Funny Valentine is brewed annually and usually goes on sale from mid January. A dunkel style beer for Valentine’s Day certainly is a funny choice. 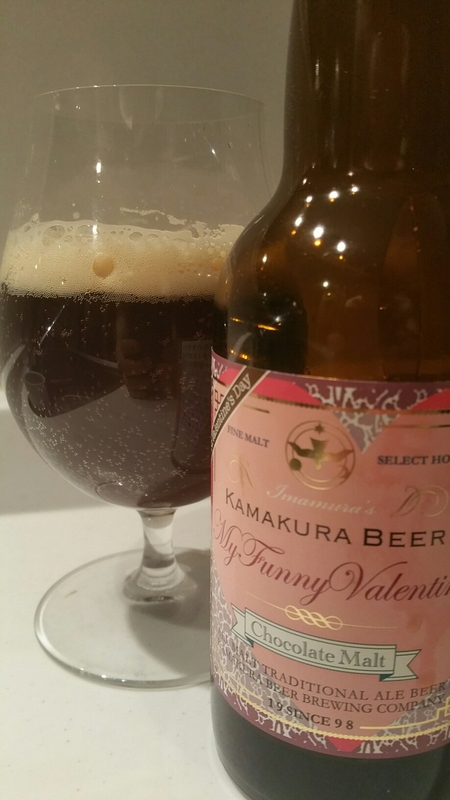 Kamakura Beer My Funny Valentine is a funny choice for Valentine’s Day – it’s not a chocolate something-something that the majority of other breweries have made so we were immediately interested. Who goes against the grain to brew a beer such as dunkel (dark lager)? There was romance in the air with wafts of cherries and caramel, all those sweet things we’ve become accustomed to in the middle of February. Kamakura Beer My Funny Valentine poured out a hazy, deep brown colour with an off-white brownish fluffy head. With it being a dunkel, Kamakura Beer My Funny Valentine is not a hoppy beer by any means, rather it relied on the malts to produce the rich deep flavours of caramel and some plum edge to it. I guess if you think that is what St. Valentine would have wanted then you are certainly the target market for Kamakura Beer My Funny Valentine. A smokey aftertaste lingered on as the aftertaste while the carbonation made me burp a bit. Not the best way to spend your romantic dinner. Kamakura Beer should be applauded for trying something different for Kamakura Beer My Funny Valentine. I’m not in a rush to try it again but wouldn’t mind if I were given it.